In recent years, interaction and communication among the members of the Association of Southeast Asian Nations (ASEAN) is becoming more frequent and close. The development and improvement of ASEAN mechanisms for regional cooperation has led to a growing tendency for more diversified topics to be on the agenda at ASEAN Foreign Ministers Meetings, Summits, and the various specialized symposia and conferences sponsored by the body. This development enables the regime for regional cooperation to expand from politics, economy, trade, and traditional security to issues of comprehensive regional governance and administration involving all social dimensions. Some social issues, which were domestic and national in development, have evolved into common international topics, which have transcended the capacity of single nations and governments to solve. Under these circumstances, sound, integrated regional interaction provides the region with exactly the driving force and platform from which to discuss solutions and probe cooperative governance. At the same time, it helps the organizations and regimes of regional cooperation become more functional. In the process of economic development, developing countries are often tempted to seek short-term economic benefit without paying due attention to environmental protection. They may achieve a great deal in developing their economies, yet when their economies have developed to a certain stage, the deteriorating environment will become an obstacle to further economic growth. Therefore, balanced and coordinated development of economy and environment is the long-term strategy. Since different countries have different environmental protection standards and penalty systems, it is quite possible for some heavy polluter companies to move their production to other countries, shifting the negative effects of polluting the environment to the countries to which they have moved. In order to prevent this from happening within ASEAN, member states have proposed to promote sustainable economic development through mutual support between environmental and economic policies, improvement and formulation of environmental legislation, regulation, procedures and policies, and cooperation in the implementation process. They have also established environment cooperation committees and negotiation and dispute settlement mechanisms. ASEAN Vision 2020 clearly states: “We envision a clean and green ASEAN with fully established mechanisms for sustainable development to ensure the protection of the region’s environment, the sustainability of its natural resources, as well as the high quality of life of its peoples.” In another cardinal document, Hanoi Plan of Action (HPA), it is promulgated that ASEAN should enhance cooperation to prevent cross-border pollution, control forest fires, and protect biological diversity and water sources, in order to protect the environment and promote sustainable development. More attention should be paid to this issue as well when we work jointly toward the establishment of the newly proposed China-ASEAN Free Trade Area to ensure the coordinated development of economy and environment. ASEAN member countries have actively negotiated and endeavored to establish a cooperative mechanism to resolve threats to people’s living environment due to severe natural disasters. The Indian Ocean tsunami of December 2004 claimed the lives of more than 300,000 people along the coasts of Indonesia, India, Thailand, and Sri Lanka, among which 160,000 were killed or missing in Indonesia alone. In January 2005, leaders of the ASEAN member states held a special conference in Jakarta to negotiate countermeasures to problems arising in the aftermath of the earthquake and tsunami. On April 23, 2005, on the occasion of the Asia-Africa Summit held in Jakarta, Indonesia, ASEAN and other countries signed a joint statement under the name of the Summit appealing to the countries concerned to invest and establish an effective early warning system to mitigate the impact of natural disasters around the Indian Ocean Rim. Measures suggested in the statement include: an integrated strategy to develop a multi-nodal early warning system with mechanisms for preparation, prevention, mitigation, and response to minimize casualties caused by natural disasters; establishment and advance of national, community-based early warning systems with simultaneous, cooperative, step-by-step development of a coordinated, collective regional system; possible establishment of a regional and international quick response mechanism; exploration of ways to increase the efficiency of collective action, such as standby arrangements for disaster relief and emergency response, networks for information exchange, and data banks and research centers utilizing scientific and technological advances; and strategies to reduce the effects of natural disasters. The statement also called for the strengthening of cultural and educational communication about disaster mitigation among Asian and African countries, especially among the experts in those countries. At the same time, it welcomed the international community to continue supplying technology and financial aid for the recovery and reconstruction of the suffering countries. It was declared that the states were committed to implementing measures to mitigate, relieve, and deal with disasters. In July 2005, the 38th ASEAN Foreign Ministerial Meeting focused on negotiating and formulating the ASEAN Charter (to make ASEAN an legal entity), as well as on establishing disaster control and emergency response mechanisms. The ASEAN Disaster Management and Emergency Response Agreement, which was signed at this meeting, provides an institutional guarantee for ASEAN to jointly respond to various disasters. ASEAN countries have also made efforts toward setting up regional cooperation mechanisms for joint development and utilization of natural resources to ensure the region’s sustainable development. Cooperation in the areas of energy and food security are particularly noteworthy. Most recently, on July 3, 2007, at the 18th ASEAN Meeting of Energy Ministers in Hanoi, participants discussed energy supply security and agreed to accelerate the realization of ASEAN leaders’ vision to establish an ASEAN energy network. On October 21, 2002, the 4th ASEAN Energy Forum was held in Bangkok with the theme of “Sustainable Energy in the 21st Century.” The participants held seminars about trends in energy development, trends in ASEAN energy demand, prospects for alternative energy, reform of energy policy, the e-business potential of the ASEAN energy industry, etc. The 8th ASEAN Council on Petroleum Conference was held in Manila, November 30-December 3, 2004. At this conference, initiated by Philippine president Gloria Arroyo, representatives from different countries discussed the possibility of establishing regional oil reserves. Raphael Lotilla, then Secretary of Energy of the Philippines, expressed his view that the establishment of regional oil reserves would be beneficial to ASEAN’s energy security and in the best interest of member countries. He said that Subic Bay, to the north of Manila, could be one location for the reserve, and that some private institutions and investors had expressed interests in making it a commercial oil reserve depot. Moreover, the US Energy Department supported this program and had suggested that the Philippine government raise capital through direct government investment or tax revenue from oil products. However, ASEAN countries had not committed to this proposal nor put it on the agenda. The regime of ASEAN Plus Three formed by ASEAN, Japan, China, and Korea has also intensified its coordination in policy in expectation of establishing energy and food supply security systems. The convention of the First ASEAN Plus Three Energy Ministers’ Meeting represented the first step in cooperation in energy. At this meeting, Japan and Korea expressed their readiness to provide funds and technological cooperation to Southeast Asia, which had not yet built up oil reserves. In order to prevent unpredictable events from upsetting the oil market, participants also discussed setting up an Asian version of the reserve system International Energy Agency (IEA) member states use to ease tension in the market. China also held a positive stance towards setting up a cooperative system. Interviewed by a journalist from Japan’s Yomiuri Shimbun, the relevant Chinese official said that if the oil reserve, source of oil supply, and transportation route can be diversified, and if China participates in the oil security protection system, China’s oil supply security would be ensured. He also said that the functionality of the ASEAN Plus Three regime should be brought into full play. The ten ASEAN countries hold 87,000 tons of rice reserves. However, during the second half of the 1990s, when there was a food shortage in Indonesia, the weakness of this cooperative reserve system became obvious. Therefore, ASEAN countries have proposed taking a further step to set up an East Asia emergency rice reserve system, in combination with the construction of the ASEAN Plus Three mechanism, in a bid to raise funds to ensure rice and grain supplies to meet emergencies. On October 8, 2004, the Fourth Meeting of the ASEAN, China, Japan, and Korea Agriculture and Forestry Ministers was held in Yangon, Myanmar. The participating ministers expressed their willingness to strengthen cooperation in agriculture, forestry, husbandry, and aquaculture. The Joint Media Statement issued after the meeting said the ministers were satisfied with the increasing cooperation in agriculture, fishery and forestry between ASEAN and the countries of China, Japan, and Korea. They also welcomed the new cooperative programs to be launched in 2004 and 2005. The ministers also stressed the importance of establishing East Asian emergency rice reserves, joint efforts to combat bird flu, and forestry-related issues. The economic development of ASEAN countries is not balanced, with urban and rural gaps within countries particularly apparent. The backward social development of the less developed areas seriously hinders regional integration. As a result, ASEAN is facing the new problem of promoting cooperation in various aspects of social affairs. At the 33rd ASEAN Ministerial Meeting held in Bangkok in July 2000, the foreign ministers from the ten member countries signed the Joint Declaration on Cooperatively Settling Social Issues in ASEAN. Dr. Surin Pitsuwan, then Foreign Minister of Thailand, said at the signing ceremony that this document and other documents signed by the foreign ministers demonstrated again the body’s commitment and resolve to cooperate closely and face the challenges together. During the meeting, the participating ministers generally agreed that ASEAN was facing a serious challenge of social problems after the Asia financial crisis, including transnational crime, trafficking in illicit drugs, trafficking in women and children, etc. Whether these problems could be properly addressed and successfully resolved would have a direct bearing on ASEAN’s development in the new century and on the relationship among ASEAN member states. Advancing common coordinated development in all fields was at the top of the agenda of this meeting, and the resulting joint declaration emphasized that in response to social problems in the aftermath of the financial crisis as well as challenges brought by globalization, a comprehensive development program must put the interests of the people first. 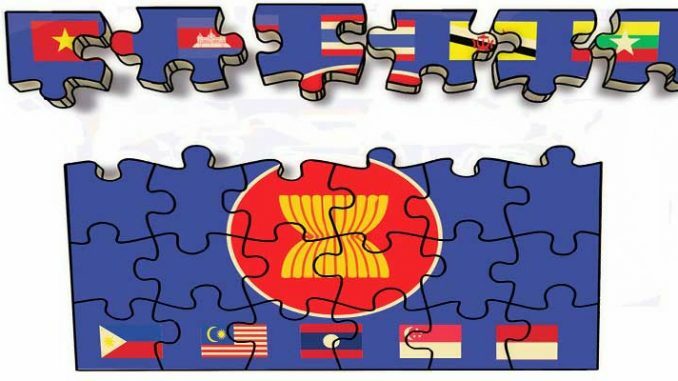 The expanded ASEAN should strive for better exploitation of human resources and the eradication of poverty, cooperatively combating transnational crimes such as trafficking in drugs and in persons, so as to build through common development a stable and prosperous, “socially cohesive and caring ASEAN” with an integrated market. The media noticed that this meeting, held at the turn of the century, by exchanging views on many concrete and immediate regional and national problems, was more realistic and relevant to the times. What merits our attention is that for the first time, the settlement of social problems and the promotion of human development were put at the top of the agenda for discussion, a clear indication that ASEAN had emerged from the shadow of the financial crisis and that its field of cooperation was expanding to a deeper level and broader dimension. At the same time, the meeting decided to speed up the implementation of the Joint Declaration for a Drug- Free ASEAN, signed in Manila in July 1998, by advancing the target year for realizing a drug-free ASEAN from 2020 to 2015. Earlier that year, in February 2000 in Manila, the 2nd ASEAN Ministerial Meeting on Rural Development and Poverty Eradication had focused on the ASEAN countries’ rural programs for poverty eradication. On August 1-3, 2001, in Singapore, the 4th Meeting of the ASEAN Ministers Responsible for Social Welfare reviewed the ASEAN Vision 2020, a commitment to develop ASEAN into a cohesive and caring community that had been adopted at the 2nd ASEAN Informal Summit in Kuala Lumpur in November 1997. An important achievement of this meeting was the issuance of the Declaration on the Commitments to Children in ASEAN, which gives full expression to ASEAN’s strong commitment to promoting the development and protection of children’s welfare in the region, including the protection of children’s rights to survival and growth, by promoting regional collaboration. Moreover, ASEAN would make this commitment an indispensable component of improving the livelihood of the people in the region, enhancing ASEAN economic and social development cooperation. It would advance children’s welfare, security, and health by eliminating poverty and homelessness, the roots of many social problems. The principles and initiatives put forward by the declaration include: (1) Protect, respect, and recognize the rights of all children, including those of indigenous people, consistent with the customs and traditions of their respective communities; (2) Recognize and encourage respect for children’s rights through mutual sharing of information on the rights of the child by ASEAN members, taking into account the different religious, cultural, and social values of different countries; (3) Acknowledge that children with special needs should be granted opportunities to enable them to take their proper place in society and live as independently as possible; (4) Create opportunities for children and young people to express their views, advocate their rights and concerns, and participate in community development; (5) Encourage the empowerment of children to meet the challenge of and seize the opportunities created by globalization; (6) Create employment opportunities for adult family members in ASEAN countries, as stable families are the key to the social , physical and emotional development of children; (7) Develop family support and family life education programs to help families, the primary caretakers of children, to nurture and protect their children; (8) Provide appropriate care, including alternative family care or home with a family environment, to homeless children and those without families; (9) Give attention to early childhood education and care through training and sharing of best practices among ASEAN child care professionals; (10) Give the ASEAN child a better future by strengthening functional literacy and promoting access to education, and information and communication technology skills; (11) Strengthen primary health care service to children; (12) Protect children from all forms violence, abuse, neglect, trafficking, and exploitation while at home, in school, and in the community, and protect children from armed conflict; (13) Give priority to children in rescue and relief operations during calamities and natural disasters in the provision of service to alleviate their trauma and hasten their reunification with their families; and (14) Establish a child-centered juvenile judicial system which fully safeguards children’s rights and promotes children’s reintegration to society. In 2004, the 17th ASEAN Ministerial Meeting was held in Jakarta on June 30. The meeting addressed the issue of violence against women and adopted the Declaration on the Elimination of Violence Against Women in ASEAN. On December 17, the First ASEAN Plus Three (China, Japan, and Korea) Ministerial Meeting for Social Welfare and Development was held in Bangkok to discuss exchange and cooperation in the areas of social welfare in East Asia. The meeting was held concurrently with the Fifth ASEAN Ministerial Meeting for Social Welfare and Development. Representatives from the ten ASEAN member states and China, Japan, and Korea held discussions around the theme of “promoting a community of caring societies.” A caring society represents the level of a nation’s civilization and is also a glorious human ideal. The theme of this meeting states clearly the ASEAN countries’ strong desire to cooperate in social welfare and development. At the meeting, ministers exchanged views on establishing caring societies, as well as on enhancing regional cooperation in accordance with the ASEAN Action Plan for social and cultural integration. As ASEAN had also decided to make this region a socio-cultural community, one goal was to solve common social problems. A report released at the end of the meeting pointed out that ASEAN countries were facing challenges in protecting women’s and children’s rights and welfare due to trafficking in persons and prostitution. Therefore, countries should increase their cooperation in social welfare, population, and family and child development, so as to lay a solid social foundation at the state level for coordinated development. This was another ASEAN effort to enhance bilateral and multilateral cooperation and promote the social welfare system. In November 2005, the 10th ASEAN Summit was held in Vientiane, Laos, with the theme “Advancing a Secure and Dynamic ASEAN Family through Greater Solidarity, Economic Integration and Social Progress.” At this summit, ASEAN leaders adopted two documents, the ASEAN Socio-Cultural Community Plan of Action and the ASEAN Security Community Plan of Action. The member countries pledged to deepen integration in all fields according to the priority areas prescribed in the documents and to accelerate the ASEAN integration process supported by the three pillars of economic, cultural and security integration. The ASEAN Socio-Cultural Community Plan of Action aimed to deepen regional social and cultural integration. Social welfare and development were listed as priority issues, which included raising the living standard of the disadvantaged minority, reducing the social crisis faced by women, children, the elderly, and the disabled, and calling on families, common people, and the private sector to participate in solving problems of penury and social welfare, for the realization of a community of caring societies and ASEAN socio-cultural integration. Participating leaders reaffirmed their resolve to narrow the development gap within ASEAN, to reduce poverty and social injustice, and to build caring societies. They also signed the ASEAN Declaration Against Trafficking in Persons Particularly Women and Children. The influence of tropical climate, irrational over-exploitation, and illegal trade, the assimilation effects of globalization, and the negative impact of drastic social transformation have caused cultural loss in ASEAN countries, as traditional customs vanish without a trace and valuable ancient architecture disappears. ASEAN has realized that the market orientation of modern society, more and more dominated by mass production and consumerism, contains negative factors destructive of human dignity, freedom, creativeness, social justice, and peace. For economic and technical reasons, ASEAN has realized that the preservation of cultural heritage cannot be achieved by the efforts of a single state. It therefore calls for the collective efforts of all ASEAN member states and support from the international community. Through regional solidarity and close cooperation, ASEAN hopes to make substantial progress in protecting and publicizing cultural heritage and cultural rights. The declaration defined “culture” and “cultural heritage” in this way: “Culture means the whole complex of distinctive spiritual, intellectual, emotional and material features that characterize a society or social group. It includes the arts and letters as well as human modes of life, value systems, creativity, knowledge systems, traditions, and beliefs.” Cultural heritage means significant cultural values and concepts; structures and artifacts; sites and human habitats; oral or folk heritage, including folkways, folklore, languages and literature, traditional arts and crafts, architecture, the performing arts, games, indigenous knowledge systems and practices, myths, customs and beliefs, rituals and other living traditions; the written heritage; and popular cultural heritage. ASEAN and member countries should collaborate in protecting the ASEAN cultural heritage. It is primarily the duty of each ASEAN member country to identify, delineate, protect, conserve, promote, develop, and transmit to future generations the significant cultural heritage within its territory and to avail of regional and international assistance and cooperation, wherever necessary and appropriate. While fully respecting each member country’s sovereignty and national property rights, ASEAN recognizes that the national cultural heritage of member countries constitutes the heritage of Southeast Asia for whose protection it is the duty of ASEAN as a whole to cooperate. Protection of national treasures and cultural properties. ASEAN shall cooperate in the protection of antiquities and works of historic significance, movable and immovable cultural properties that are manifestations of national history, of great structural and architectural importance, of outstanding archaeological, anthropological, or scientific value, or that are associated with exceptional events and are to be considered or declared National Treasures and Protected Buildings or Protected Artifacts. Historic sites, cultural landscapes, areas of scenic beauty, and natural monuments shall be identified, recognized, and protected. ASEAN member countries shall take necessary measures to safeguard cultural heritage against all human and natural dangers to which it is exposed, including the risks due to armed conflicts, occupation of territories, or other kinds of public disorders. Sustentation of worthy living traditions. ASEAN member countries shall cooperate to sustain and preserve worthy living traditions and folkways and protect their living bearers in recognition of people’s right to their own culture; to protect, promote, and support worthy, highly creative living traditions within the framework of national and regional, social, cultural, and economic development undertakings; to design learning programs for living traditions, stressing the dignity and wisdom of these traditions and promoting creative diversity and alternative world views and values. Preservation of past and living scholarly, artistic, and intellectual cultural heritage. The masterpieces and creations of profound traditions by eminent sages, philosophers, artists, and writers of the past and present serve as perpetual beacons of insight and illumination, wellsprings of guidance and direction for present and future ASEAN peoples. Their protection, documentation, preservation, and promotion are of the highest priority. Preservation of past and living popular cultural heritage and traditions. Popular forms of expression in mass cultures constitute an important artistic, intellectual, sociological, anthropological, scientific, and historical resource and basis for social and intercultural understanding. ASEAN shall encourage and support the preservation of outstanding “popular” traditions and heritage. Enhancement of cultural exchanges and deepening understanding of different cultures. On August 12, 2000, the 9th ASEAN Youth Day Meeting was held in Yangon to discuss such topics as how to elaborate the function of youth, maintain national cultural traditions, and prepare for the 3rd ASEAN Ministerial Meeting on Youth. Promoting the development of tourism in each ASEAN country is an important part of the region’s cultural development and also an important topic in ASEAN regional cooperation of recent years. Therefore, Cambodia, a country with rich tourism resources and historic and cultural heritage, hosted three ASEAN meetings on transnational tourism. The 14th ASEAN Tourism Conference was held in Phnom Penh July 12-13, 2001. The conference discussed implementing an ASEAN tourism strategy, establishing an ASEAN tourism website, promoting ASEAN tourism projects, boosting international and intra-ASEAN tourism, encouraging the private sector to organize activities that could promote ASEAN’s tourism strategy, etc. On November 4-5, 2002, ASEAN leaders signed the ASEAN Tourism Agreement at the 8th ASEAN Summit; the theme of the agreement was to further boost the development of ASEAN tourism. On January 21-27, 2003, at the 22nd ASEAN Tourism Forum in Phnom Penh, the ten ASEAN countries’ ministers of tourism issued a joint statement in support of strengthening the safety of ASEAN tourism. The statement emphasized that the tourism ministries would cooperate closely with relevant government institutions, strengthen security checks at airports, seaports, and tourism sites, and jointly guard against and combat terrorism to build a safe travel environment for tourists. The ministers agreed to set up a tourism security website to offer accurate, timely tourism security information to the public, mass media, and foreign governments. They also agreed to realize the Mutual Abolition of Visa Requirements by 2005. In 2006, the 39th ASEAN Ministerial Meeting was held in Kuala Lumpur on July 24-28. The main achievement of this meeting was to sign the ASEAN Framework Agreement on Visa Exemption. According to this agreement, the citizens of member states could realize free transnational travel within the region for 14 days without applying for a visa. This was another important move toward the goal of regional integration and regional economic integration. In fact, there are several bilateral agreements of mutual abolition of visa requirements among ASEAN countries, allowing one treaty country’s people to make short visits to another treaty country without a visa. The time-limit in some agreements is even as long as one month. However, so many bilateral agreements were confusing to travelers. The new ASEAN framework agreement aimed to regulate those bilateral agreements. Based on this framework, countries could make adjustments according to their own requirements. Generally speaking, more affluent countries exercise tighter control of entry visas for people from less developed countries. However, things were quite different in ASEAN, where Myanmar had the strictest visa requirement. Except for citizens of the Philippines, Myanmar required all visitors from other ASEAN countries to have visas. The reason was that Myanmar’s military government had too many misgivings about the external world. Therefore, the fact that the foreign minister of Myanmar agreed to sign the agreement marked great progress in realizing complete freedom of travel for transnational tourists among ASEAN countries. Another unexpected country that signed the agreement was Laos. This not-so-open country had mutual Abolition of Visa agreements with a few countries, but at this meeting expressed a strong desire to integrate into ASEAN. Obviously, this agreement would bring great benefits to regional tourism. What is more significant is that in competition with the two growing economic giants of China and India, ASEAN must accelerate the integration process in order to survive as an integrated whole. Reducing visa restrictions and encouraging the movement of people would help build closer business connections among ASEAN countries. Just as Syed Hamid Albar, current Chairman of ASEAN and Foreign Minister of Malaysia said, the significance of the agreement is to promote ASEAN solidarity, to create more convenient conditions for ASEAN country citizens to travel freely, to bring a sense of belonging to every single citizen of the ASEAN countries, and to accelerate the realization of the ASEAN Community by 2020.